Elegant French-inspired dining on the Napa River. : This French country restaurant is located in an historic boathouse next to the Napa River. 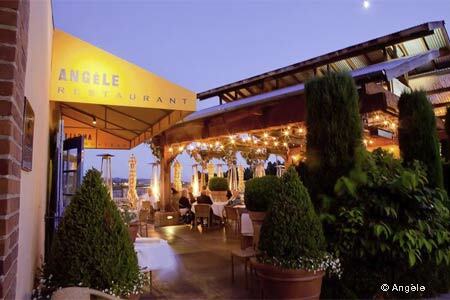 Angèle specializes in bistro fare offering a relaxed dining experience any time of the year, with indoor and outdoor seating. Dishes combine California influences, traditional sauces and classic techniques. Start the meal with oysters, steak tartare or garden-fresh asparagus. Entrées continue with hearty comfort food such as cassoulet, steak frites and braised chicken "vol au vent." Valrhona chocolate mousse and banana gratin are highlights from the dessert menu. The California-French wine list enhances the food and emphasizes local wines. Be sure to browse the cocktail list, which presents clever creations such as "Cigarettes & Coffee" (rye, amaro, Gran Classico and tobacco tincture).